Maha Shivaratri or Shivratri Utsav is a famous Hindu festival in honor of Lord Shiva, one of the Trimurtis in Hinduism. Sivaratri, which literally means “Great Night of Shiva” or "Night of Siva”, is observed on the 13th night/14th day in the Krishna Paksha on the month of Phalgun (February – March) in the Hindu Calendar. Mahashivaratri is celebrated on the night before Amavasya, the night before and day of the new moon. In 2019, the date of Maha Shivratri Festival is on 4 March, Monday. There are numerous interesting legends associated with Maha Shivaratri festival. According to Rudra Tandava, it was on the Shivaratri night Lord Shiva performed the ‘Tandava Nrithya’ – the cosmic dance of primeval creation, preservation and destruction. Another popular legend is that, Shivrathri marks the divine wedding day of Parvathi Devi and Lord Shiva. According to Linga Purana, Lord Shiva manifested himself as the 12 Jyotirlingas (lingams of light) on Shivaratri Day. 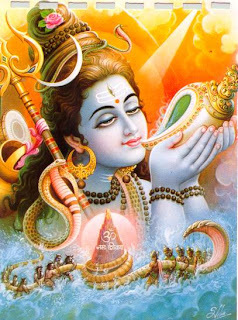 Maha Shivaratri is also associated with Samudra Manthan (the Churning of the Ocean), and this is one of the most popular legends associated with Sivaratri. Devas (Gods) and Asuras (Demons) churned the Ocean of Milk to get Amrit or Amrita (the nectar of immortality). While performing the Samudra Manthanam, a pot of highly toxic poison (Kalakuta or Halahal) came out of the ocean. Devas and Asuras were terrified seeing the poison as it was so toxic to destroy all creation. Lord Vishnu advised the Devas and Asuras to pray and seek help of Lord Shiva. Out of compassion for living beings, and leased with the prayers of devas and asuras, Lord Shiva drank the poison. Goddess Parvati was terrified seeing this and stopped the poison in Lord Shiva’s throat with her hands. The poison was so toxic that Shiva’s throat turned blue. Thus the name Neelakantha, which literally means “One who has Blue Throat”. Devas and Asuras started praying the whole night and Lord Shiva was pleased with their devotion and said whoever worships me on Shivaratri day will get all their wishes fulfilled. Every year Shivratri is celebrated across the country with much religious fervor by all Hindus. Devotees fast on Shivarati day, singing Shiva Bhajans, chanting Shiva Mantras and Sanskrit Stotras, offering prayers in honour of Lord Shiva and Goddess Parvati Devi. Most devotees also visit nearby Lord Shiva temples and offer prayers and worship on Shivratri Day. The corresponding month of Shivaratri in Kerala is Kumbha, and in Andhra Pradesh, Gujarat, and Maharashtra it is Maagha (Magha).